The second session this year is on Thursday 14th March, from 4:30 – 5:30 pm at Wycombe High School. All the sessions are free, and there will be tea/coffee and biscuits provided. Due to popularity we are restricting participants to a maximum of 2 per school. Sessions are open to all teachers of Primary Mathematics and will be led by Rachel Walters. The Maths Hub can offer places for 2 teachers / school. 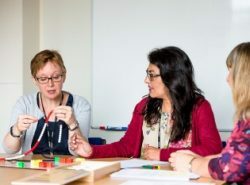 All courses and events are subsidised by grant-funding through the NCETM. Schools may cancel up to 7 days before the course or may substitute teacher names at any time before the first session. Schools who sign up to this course are expected to attend. Schools who do not attend the session they have booked will be liable to pay a cancellation fee of £50.